Almost a year after winning the Innov865 Week’s Startup Day 2018 pitch competition, Smart RIA is on the brink of international expansion, thanks to partnerships forged through that program. While CEO Mac Bartine stood on stage accepting a $10,000 check for Smart RIA at the Sept. 2017 event, he noticed a man in the audience trying to get his attention. That man was Paul Folta, a semi-retired business development executive with a specialty in international business. He told Bartine Smart RIA was a good candidate for international expansion. Smart RIA’s software streamlines the regulatory process for registered investment advisors. Most of their clients are independent business owners. Bartine said the company worked with 2 consulting firms and had 400 RIA client firms in Sept. 2017. As of late July, Smart RIA has strategic partnerships with 14 consulting firms and more than 950 RIA firms as clients. “We have more than doubled (customers) in the last year,” Bartine said. They’ve tripled revenue in the last year. Building partnerships with consultants is a quick way to scale the company, as the software trickles down through their clients. The software doesn’t eliminate the need for consultants, Folta said, rather it adds value to what the consultant offers client RIAs. In the next year, Bartine estimated they will triple business and then double business again the year after. The team will hire more developers, customer service reps and sales people. The company plans to stay headquartered in Knoxville, Bartine said. Published on August 14, 2018 by Deborah Robbins. The next Bunker Brews – Knoxville meet-up is set for 4:30 to 6:30p.m. Thursday, February 22 at Maple Hall, 414 South Gay Street, Knoxville. This is the latest event in the overall effort to organize a Knoxville Chapter of the non-profit organization that is focused on helping veterans interested in being entrepreneurs. You can read Teknovation.biz’s most recent article about the effort here that also includes a registration link. Future865 promises diverse discussion on the types of entrepreneurship happening in Knoxville. The event will kick off Innov865 Week 2017 on Monday, September 18 and explore opportunities to build the most effective and vibrant future for Knoxville with community, business and thought leaders. A variety of presenters will describe their visions for harnessing innovation and entrepreneurship in building a stronger ecosystem and propose solutions in an engaging environment with the audience. Future865 will include presentations on issues such as the importance of angel investing, innovations in healthcare, intelligent transportation, and entrepreneurship in Knoxville’s food industry. Wendy Lea, CEO of Cintrifuse will be serving as the featured keynote speaker for Future865. Cintrifuse is a startup catalyst, a public private partnership designed to build a tech-based economy in the Greater Cincinnati Region. Having delivered business solutions in 30 countries, Wendy Lea brings a worldly point of view to digital innovation and her entrepreneurial pursuits. She also is a member of C200 and Cincinnati Women’s Executive Forum. In 2012 and 2013, Wendy was recognized as a Women of Influence in both Silicon Valley and San Francisco. She currently serves on the boards of The Cincinnati Symphony Orchestra, The Health Collaborative, INTERalliance of Greater Cincinnati, TechStars, and venture-backed Xyleme in Boulder, Colorado. Published on August 31, 2017 by Deborah Robbins. One of those speakers will be Dr. Bruce Ramshaw, Professor and Chair of the Department of Surgery at the University of Tennessee Medical Center, where he will be discussing innovations in healthcare. He received his medical degree from the University of Florida College of Medicine and has been in practice for more than 20 years. He has been recognized internationally for laparoscopic and advanced hernia procedures, and he also specializes in creating patient-centered care teams. Most recently, Dr. Ramshaw served as chair of the Halifax Health Medical Center General Surgery Residency Program in Daytona Beach, Florida, since 2009. In addition to being an education leader, Dr. Ramshaw has founded multiple companies in the healthcare field including Advanced Hernia Solutions and Surgical Momentum. Advanced Hernia Solutions has helped complex hernia patients from all over the world on the basis of a patient-centered care model. Surgical Momentum, dissolved in April 2017, was a patient safety organization that was established in 2009 after Dr. Ramshaw recognized there could be vast differences in how the same hernia mesh reacted in different patients. Using Continuous Quality Improvement principles, Surgical Momentum worked with medical device manufacturers, pharmaceutical companies and distributors to improve value, quality of care and patient outcomes. Published on August 15, 2017 by Deborah Robbins. Knoxville, Tenn.– Applications are now being extended for Innov865 Week’s Startup Day 2017 pitch competition. The event will feature six East Tennessee startups pitching their businesses for a chance to win up to $15,000 in cash prizes. This is the fifth Startup Day pitch competition and the signature event of the second annual Innov865 Week, a celebration of Knoxville’s vibrant entrepreneurial community, September 18-22, 2017. To apply for the pitch competition, eligible startups must be located in the East Tennessee region and fill out an application, available on the Innov865 Week website: http://innov865week.com/pitch-competition/. Applications will be accepted from June 16 through July 10, 2017. The Innov865 Alliance will review applications and select six startups to participate. Applicants will be notified of the Alliance’s decision no later than July 17, 2017. Startup Day 2017 is Thursday, September 21, 2017 at the U.S. Cellular Stage at The Bijou Theatre. New this year, the Startup Day pitch competition will feature two prize categories: judges’ choice and crowd favorite. Competitors will have an opportunity to win up to $15,000. T&T Scientific claimed the winning prize during Startup Day 2016. In addition, the Innov865 Traction Award presented by UT Federal Credit Union will return this year recognizing a Startup Day alum who has made the most progress. Innov865 Week 2017 promises another packed week of educational panels, investor roundtables, demo days, and networking opportunities. The week will kick-off on Monday with Future865, an event that will explore opportunities to help Knoxville leverage its many assets – social, cultural, and technical – to become THE destination for entrepreneurs in the Southeast. Other scheduled activities include a technology showcase hosted by Oak Ridge National Laboratory and the University of Tennessee Research Foundation; The Works hosted by the Knoxville Entrepreneur Center; the return of the Maker Summit and Elev865, an exclusive networking event for business leaders and entrepreneurs; and the roll-out of Olli, a self-driving, fully electric vehicle that was created and manufactured by Local Motors, a Knoxville-based company that designs and builds innovative motor vehicles. The inaugural Innov865 Week in 2016 was a wild success, featuring 25 events and drawing more than 1,400 startups, entrepreneurs, makers, investors, business leaders, students, and community leaders from across East Tennessee. Published on June 21, 2017 by Deborah Robbins. 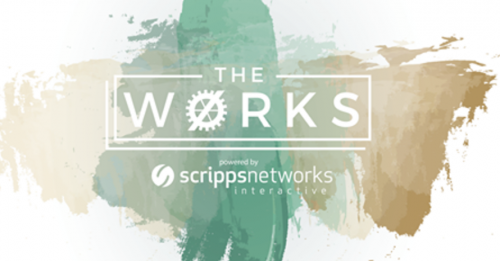 The Knoxville Entrepreneur Center (KEC) unveiled the eight companies that comprise the cohort for this year’s “The Works” accelerator at a kickoff party last night in The Old City. It’s a slightly different mix of companies than the early stage nature of the ones that, for the most part, have been part of the past cohorts. The energetic musician and entrepreneur in his own right noted that the program in the past was characterized by start-ups that had a media or content idea or fell into the coding category. Prometheus Group, a company focused on helping businesses working across the globe utilize intelligence to better manage their risks. With the shift in the stage of evolution of the companies, there will be a natural modification of the programming. He said the programming for the teams will be more individualized and focused, helping them identify two or three key strategic priorities based on a myriad of factors and use KEC’s full slate of resources to achieve those milestones. “It’s also worth noting that our program still has a major media bent to it,” Sexton added. “We are experimenting to see if we can leverage media skillsets and talent to support each start-up. We believe that every company is a media company now, everyone is making their own content on social media or otherwise. After a few years of doing this kind of work, we are uniquely positioned to plan, create, and execute on content creation for our teams with the help of our specialist’s program. For more details on the eight companies, read the KEC-provided summary (2017 The Works Cohort). Published on June 09, 2017 by Deborah Robbins. In 1980, The Wall Street Journal called Knoxville “a scruffy little city.” What the writer would see today is a beautiful and thriving Knoxville. We live in a city and region that is truly world class. We’re #1 in national parks with Great Smoky Mountains National Park, the most visited national park in America. We’re #1 in lifestyle media with Scripps Networks Interactive, RIVR Media, Jupiter Entertainment, NorthSouth Productions, and more. We’re #1 in homebuilding with Clayton Homes. We’re #1 in movie theaters with Regal Entertainment Group. We’re #1 in travel centers with Pilot Flying J.
We’re in the #1 state for growth and innovation in education with programs like Tennessee Promise. We’re #1 in recreational boating with over 20 manufacturers including Brunswick and Malibu. We’re #1 in church management software and online giving with Ministry Brands. We’re #1 in pursuing novel detection and treatment for cancer with companies including ProNova and Provectus and EDP Biotech. We’re #1 in 3D printing with Oak Ridge National Laboratory, Local Motors, and more. We’re #1 in outdoor recreation with the Urban Wilderness, Ijams, and hundreds of lakes, rivers, and parks. We’re #1 in nuclear safety and security with Y-12, Analysis and Measurement Services Corporation, and more. We’re #1 in jewelry e-commerce with Jewelry Television. We’re #1 in pet products with Radio Systems Corporation. We’re #1 in public power with the Tennessee Valley Authority. We’re #1 in important things that start with the letter B: beans (Bush Brothers), bacon (Benton’s), breweries (more than any other city in Tennessee), and barbecue (too many great places to list). According to Forbes, we’re the #2 happiest city to work in right now, but based on all of the above, I’d say we make a strong claim to #1. As we celebrate springtime in Knoxville with the Big Ears Festival, the Dogwood Arts Festival, the International Biscuit Festival, Earthfest, Outdoor KnoxFest, and the Rossini Festival, we can be sure that Knoxville is a pretty great place to live and call home. In fact, we’re #1. Published on May 30, 2017 by Deborah Robbins. April’s Innov865 Happy Hour sponsored by Three Roots Capital welcomed a special announcement from Knoxville Mayor Madeline Rogero, telling a hefty crowd at Scruffy City Hall that Local Motors’ self-driving electric vehicle Olli will soon be making its debut this September during Innov865 Week. Olli was created at Local Motors’s micro factory in Hardin Valley using 3D printing technology. Add that to the many reasons you should attend the Innov865 Alliance’s Signature Week celebrating entrepreneurship and the Knoxville startup community. This comes after a series of technology announcements in East Tennessee. In Market Square earlier Thursday, Olli was unveiled for the public to get an up-close look at the innovation happening in Knoxville. 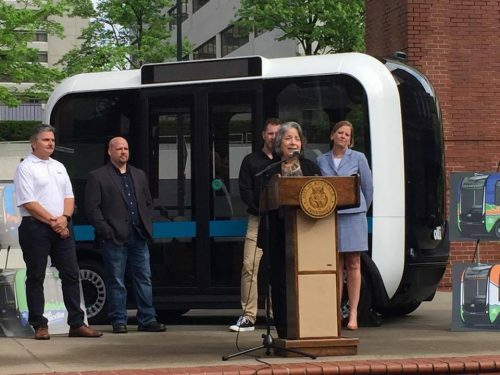 Knoxville Mayor Rogero announcing self-driving vehicle Olli will soon be taking over City streets. It’s important to mention, Visit Knoxville is going to roll an Olli out on a test basis this fall at some events in places like World’s Fair Park and Chilhowee Park and Exposition Center. The longer-term goal is to have Olli running on city streets, by the end of next year, for Visit Knoxville events and giving tours of the city following pre-programmed maps. There was also a separate announcement on Tuesday from Knoxville entrepreneur Bill Malkes, founder of GRIDSMART. The company has donated some of its new STREETSMART Wi-Fi data cameras for the City of Knoxville to pilot at some of the busiest intersections along Kingston Pike, specifically the intersection of Kingston Pike and Northshore Drive. These cameras collect real-time traffic information on traffic flow and congestion, which City engineers can use to get better information about how and when traffic backs up on that corridor. This will help the City make better adjustments to signal timing and eventually to respond immediately to changing conditions so that they can reduce congestion, reduce vehicle emissions, and get everybody where they’re going faster. These two technologies combined could eventually become a fully connected smart transportation system, where you have vehicles like Local Motors’ Olli sending and receiving information to infrastructure like GRIDSMART’s cameras, allowing everything to move much more efficiently. With both of these announcements and the work going on at Oak Ridge National Laboratory and across the Innovation Valley, Knoxville is well positioned to be on the forefront of smart transportation technology. During the April Innov865 Happy Hour sponsored by Three Roots Capital, there was also a featured fireside chat with GRIDSMART Founder Bill Malkes and Three Roots Capital CEO & Meritus Capital Management Managing Partner Grady Vanderhoofven. The two, along with moderator Tom Ballard of PYA and Teknovation.biz, discussed the founding and growth of GRIDSMART and the role the company is playing in the intelligent transportation industry. 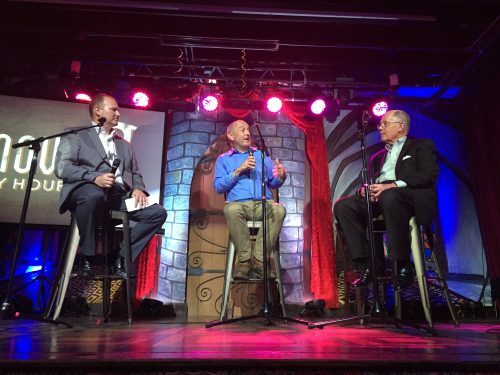 Bill and Grady talked about how the company was founded, raised capital, staffed the business, developed its product, established and expanded production in East Tennessee, and what the future holds for GRIDSMART. Published on April 27, 2017 by Deborah Robbins.